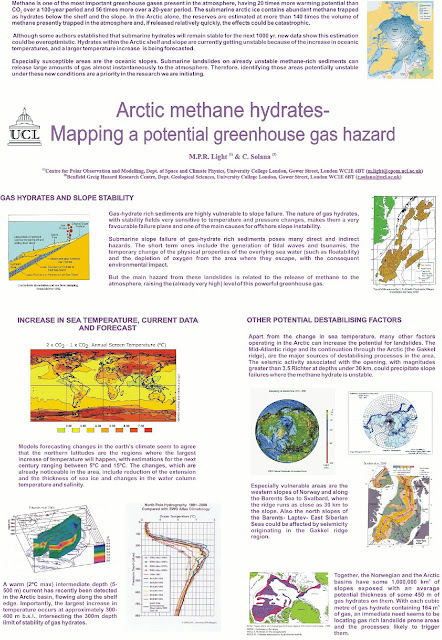 Temperature data are used to calculate methane emission points in the Arctic, pointing at methane hydrates disturbed by seismic activity as the likely source of high methane concentrations in the Arctic. 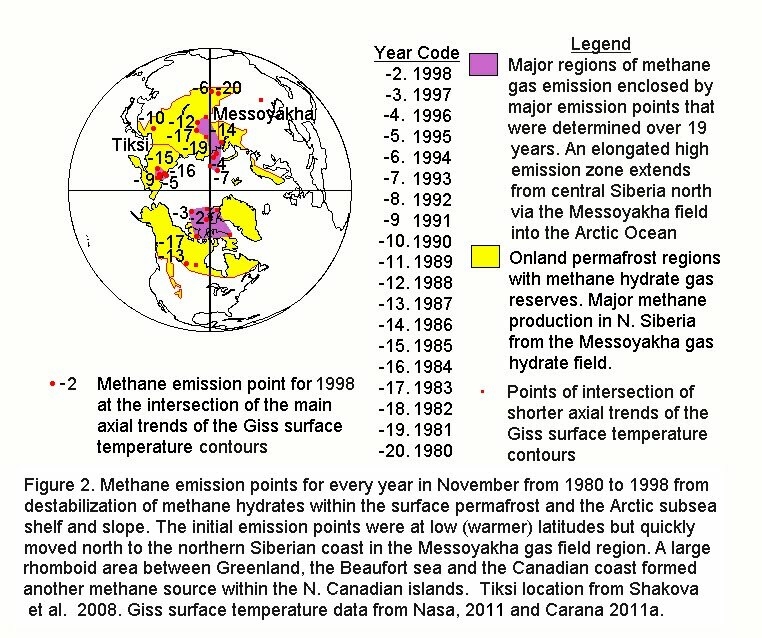 Methane concentrations in the Arctic are higher than elsewhere in the world, as shown on the NASA image below. 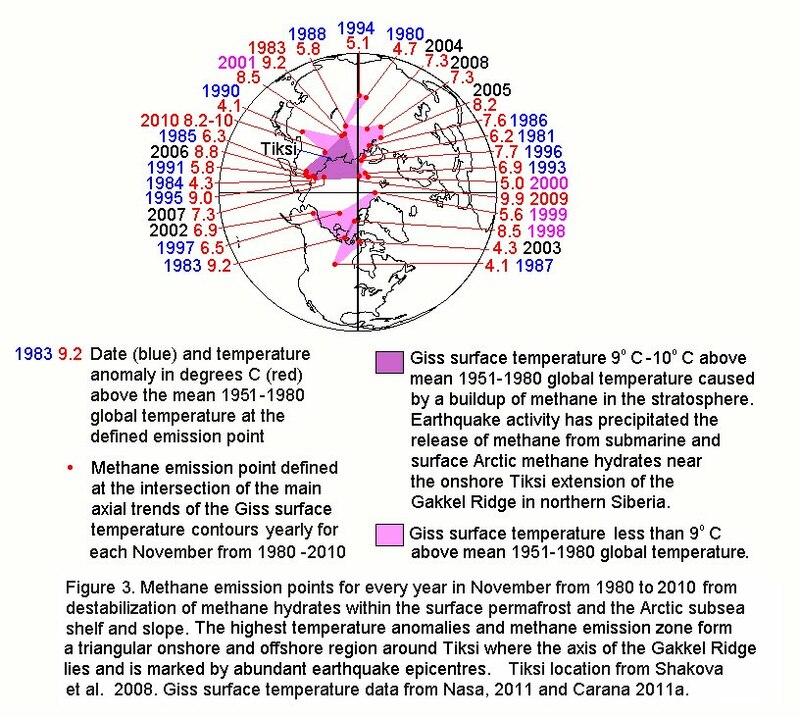 Series of research flights have, over the past few years, provided a detailed picture of methane in the Arctic atmosphere at different altitudes. 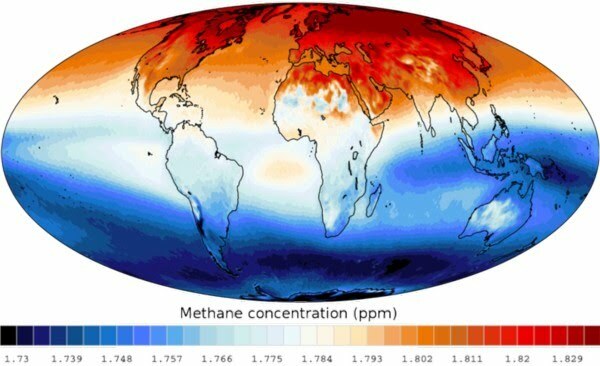 In many descents, enhanced methane concentrations were observed near the surface of the Arctic Ocean, sometimes in otherwise pristine air, possibly signifying emission from biogenic sources or from methane hydrates, concludes a study recently published by the Royal Society, as shown on adapted image left. A Russian-U.S. expedition comprising 28 scientists has, in its research of the Arctic seas, found powerful methane emissions in the northern sector of the Laptev and Bering seas. Expedition Chief Igor Semiletov says that 'methane torches' have been running up from the depth of the ocean with methane emitted into the air. Possibly, methane comes from the depth of the Earth crust, which is a sign of a strong seismic activity in this region, Semiletov said. The images below show how methane emission points can be derived from Arctic temperature peaks. 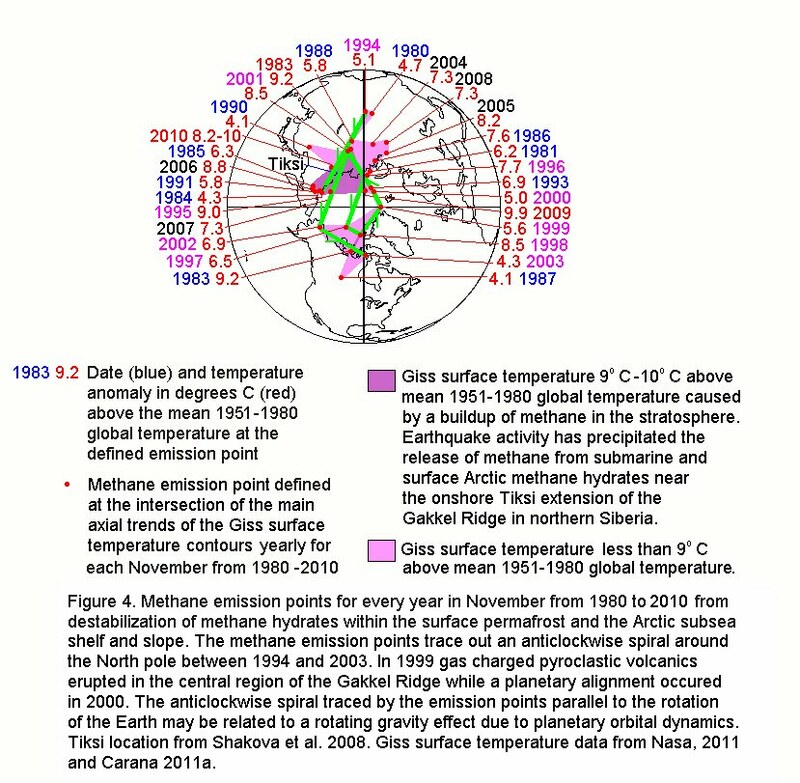 Figure 1 below shows how methane, emitted from the surface permafrost and submarine Arctic hydrates, is spreading in the stratosphere in the northern Hemisphere in a great circle, around a cold high pressure zone centred on the fringes of Western Europe. 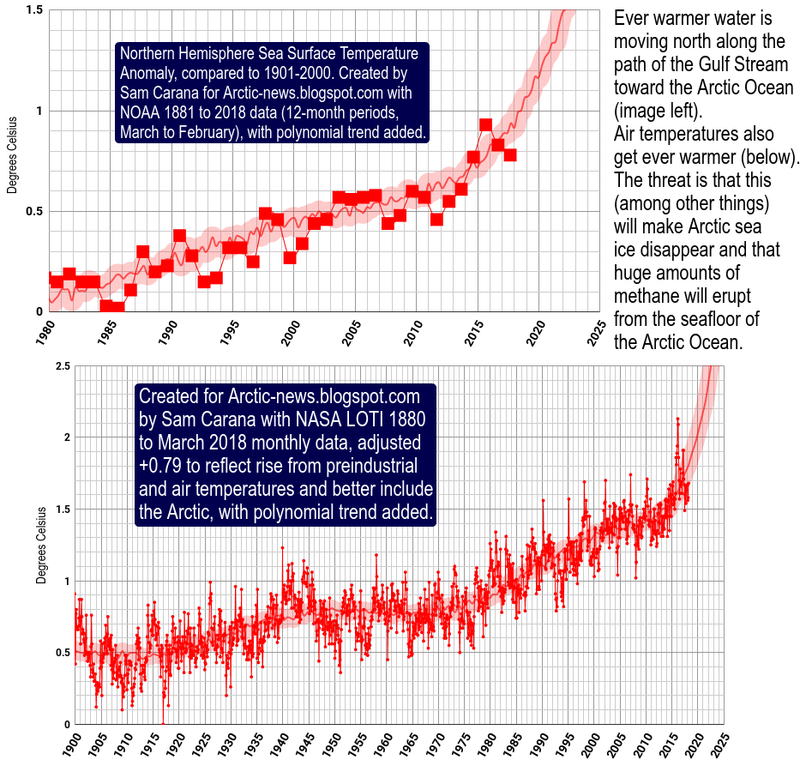 Temperature anomalies, caused by the stratospheric dispersion of Arctic methane, originate in the Arctic permafrost and Arctic Ocean areas and are spreading further and further afield as time progresses. November was chosen as it shows the largest temperature anomaly in 2010 and using the same time interval each year eliminates the effect of changes in the inclination of the Earth to the Sun (Nasa, 2011). 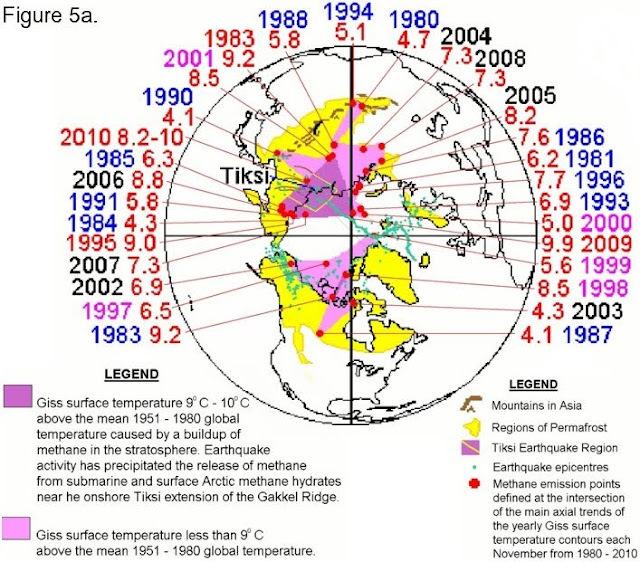 Earthquake activity has precipitated the release of methane from submarine and surface Arctic methane hydrates near the onshore Tiksi extension of the Gakkel Ridge in northern Siberia. Figure 2 below is added for comparison, showing emission points in November from 1980 to 1998. Figures 3 and 4 below show the November emission points from 1980 to 2010. 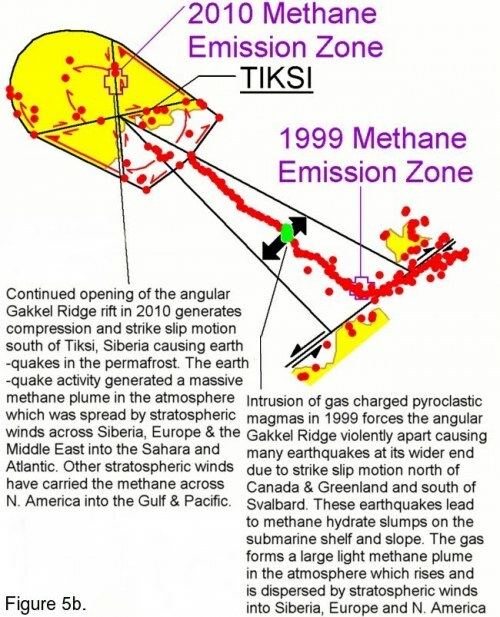 Figures 5a and 5b below show the relationship between Gakkel Ridge earthquake activity and the methane emission points, as well as a geological explanation for the origin of the 1999 and the 2010 methane plumes emitted in the Gakkel Ridge area. Because the density of methane is slightly more than half of that of the air (Engineering Toolbox, 2011), it must rise upwards into the middle troposphere along a gradual curve the trend of which will be determined by Corioli's force as the cold heavy surface Arctic air spirals out in a clockwise fashion from the northern latitudes (NSIDC, 2011b). Above 5 km in the mid to upper Arctic troposphere and stratosphere (ca 30 km height), there is a perpetual anticlockwise (cyclonic) massive vortex circulation, which is asymmetric often breaking into two units separated by a low pressure trough above the E of North America (NSIDC 2011a). In winter the giant anticlockwise spiraling stratospheric vortex generated over the central Arctic ocean may become irregularly shaped, breaking into two separate spirals (the vortexes are like two giant tornadoes) centered over the northern Siberian Arctic offshore shelf (which is the region of present day massive methane leakage from disassociating submarine methane hydrates) and the Beaufort Sea - Northern Canada and the United States. The Arctic Ocean floor sourced methane must be sucked up into the stratosphere by these two giant tornado systems that are rotating anticlockwise in sympathy with the Earth. 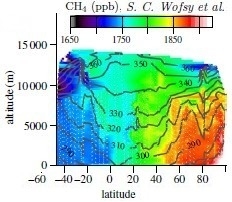 The high altitude methane is subsequently carried SW over Russia, Europe and into the Atlantic by the variably shaped anticlockwise rotating stratospheric vortex at some 30 km altitude, while a second vortex developed over Canada will similarly carry methane over the continental United States. 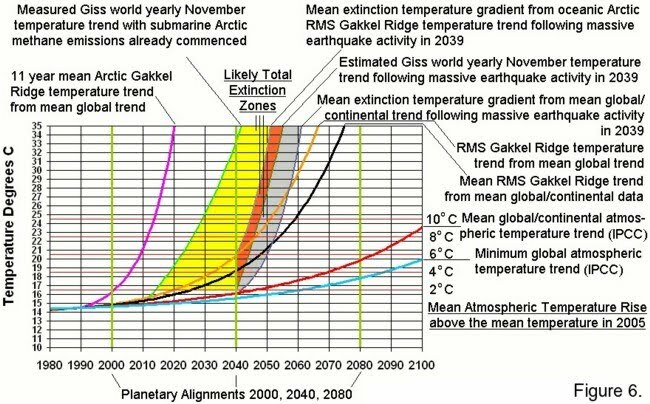 The atmospheric temperature trends calculated from IPCC (2007) long term gradients and the estimated Arctic temperature trends from Gakkel Ridge earthquake frequency data are compared to estimated Giss temperature trends for November each year from Nasa 2011 data (Figure 6). The trends of increase of the Giss temperature anomalies match very closely the 11-year moving average Arctic Gakkel Ridge temperature trend and indicate that a large (yellow region) total extinction zone has already started with the massive Arctic methane emissions in 2010, on schedule to reach its climax in the 2040's to 2050's. In conclusion, methane in the Arctic can be linked to seismic activity. 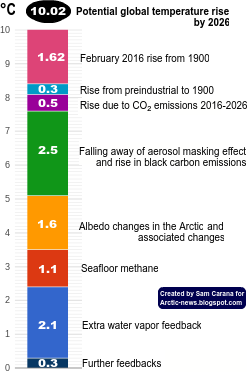 As temperatures of deep waters of the Arctic Ocean keep rising, further seismic activity can be expected to trigger further releases of methane from hydrates that are likely to make the planet uninhabitable within decades. Only rapid cooling of the oceans' waters can avoid this. To accomplish this, even a complete cessation of carbon dioxide emissions by developed and developing nations combined will not suffice. Geoengineering will have to be deployed to save humanity. Engineering Toolbox, 2011. Gases - Specific Gravities. Lide D. R. and Frederikse, H.P.R., 1995. Handbook of Chemistry and Physics. 75th Ed. CRC Press, London, pp. 1-1 to 1 -33. National Snow and Ice Data Center (NSIDC), 2011a. The Polar Vortex. National Snow and Ice Data Center (NSIDC), 2011b. Arctic Climatology and Meteorology. 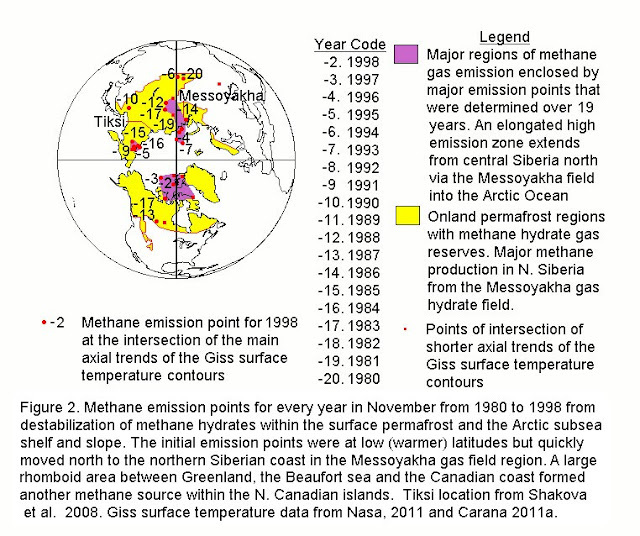 Heavy methane emissions found in the Arctic Eastern sector. Shakova, N., Semiletov, I., and Panteleev, G.
The distribution of methane on the Siberian Arctic shelves: Implications for the marine methane cycle. 2005. Geophysical Research Letters 32: L09601.doi:10.1029/2005GL022751. 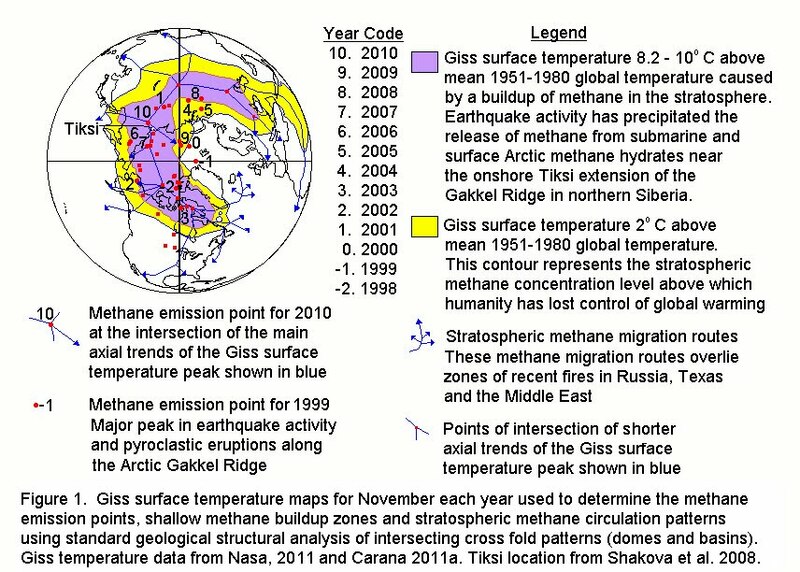 Shakova, N. and Semiletov, I.
Methane release and coastal environment in the East Siberian Arctic shelf. 2006. Journal of marine Systems 66 (1-4): 227-243, doi:10.1016/j.jmarsys.2006.06.006. Shakova, N., Semiletov, I., Salyuk, A., Kosmach D., and Belheva N.
Methane release on the Arctic East Siberian shelf. 2007. Geophysical Research Abstracts, 9, 01071. Shakova, N.E., Semiletov, I.P., Salyuk, A.N., Belheva, N.N., and Kosmach, D.A. Methane Anomalies in the Near - Water Atmospheric Layer above the Shelf of East Siberian Arctic Shelf. 2007. Doklady Earth Sciences 415(5): 764768.doi:10.1134/S1028334X07050236. Shakova, N., Semiletov, I., Salyuk A., and Kosmach, D.
Anomalies of methane in the atmosphere over the East Siberian shelf: Is there any sign of methane leakage from shallow shelf hydrates? 2008 EGU General Assembly, Geophysical Research Abstracts, 10, EGU2008-A-01526. Shakova, N., Semiletov, I., Leifer, I., Salyuk, A., Rekant, P., and Kosmach, D.
2010. Journal Geophys. Research 115, C08007, doi:10.1029/2009JC005602. Shakhova, N., Semiletov, I., Salyuk, A., Yusupov, V., Kosmach, D. and Gustafsson, O. 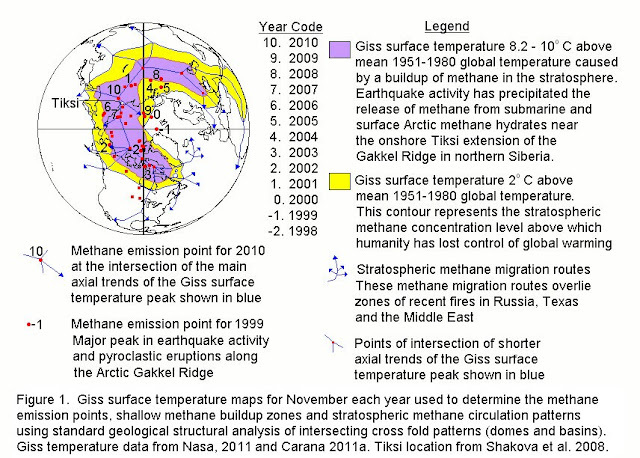 Extensive methane venting to the atmosphere from sediments of the East Siberian Arctic Shelf. Poster created for Geophysical Congress on methane hydrates, earthquakes and global warming, Nice, France, 2002, by Malcolm Light and Carmen Solana. 1. Left-click on above image and a larger version will appear in a "lightbox"
3. Make the following selection from that menu: "Open image in new tab"